This is one more of that original set of 12 cards from 3 sheets of 12x12 paper that I made. 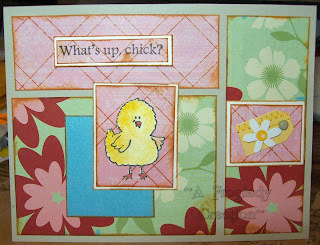 I used Hambo Stamps cute little chick on it :) Adorable! 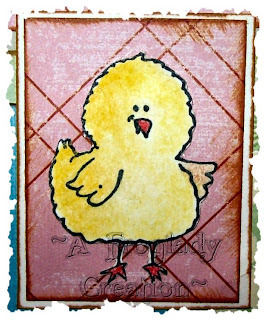 Using my Noir Palette Ink I stamped the chick and then I colored her in with my Prisma Watercolor pencils and my SU blender pen. she kinda looks fuzzy like feathers doesn't she?!?!? The paper I used started to pill a little but I liked the effect it gave so I went with it. Cognac Palette Ink was used to edge all the papers to give it a bit of a distressed look. doodlebug design inc. [tags & tabs] 1363 Spring was used on the side for the floral tab with a mini brad from my embellies stash. if you haven't shopped there before you are in for a treat. Check them out! Their customer service is excellent and they have super fast shipping! This was really a wonderful set of cards - I have been enjoying seeing what you did with all if these cards. It looks like you spent hours and hours making them all!! This is just the Cutest!! I love this little chick! !